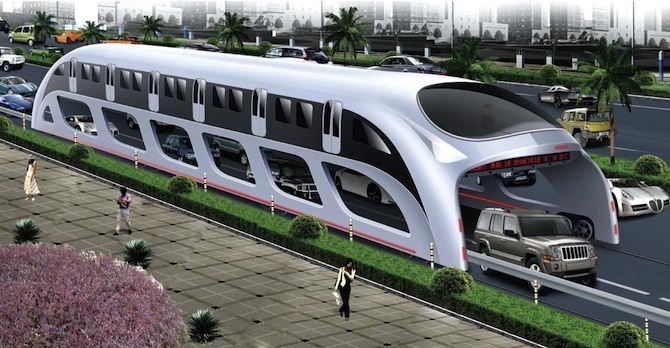 In mid-2010, China debuted a prototype design for a “straddling bus”; a giant train-like vehicle that would use existing street lanes and drive overtop of traffic. The massive vehicle would carry 1200-1400 passengers at any given time, stands 4.5m high with two levels, and can travel 60km/h. It would travel over existing streets because of its elevated design. The bus concept was created as a solution to China’s major congestion problems, and also as a means to reduce their exorbitant pollution levels. It would be powered by electricity and solar power, which presents a major innovation for such a large vehicle. For cities interested in building this bus, it will cost 500 million yuan, or approximately 8 million USD. Three years later, a life-size prototype has yet to be developed, but the hope remains that China or another populated nation will take on the project. The bus travels on a rail track similar to a subway, but only a 10% equivalent of building a subway track. It’s been estimated that the bus would reduce traffic by 20-30%. In the U.S., getting past the regulation hurdles may prove expensive and challenging, but if another country can prove that it’s a feasible solution, wide adoption would likely become a faster process. Some of the biggest hurdles the development team will face include getting drivers used to a moving tunnel driving over them. Others include how to clean up the vehicle in the event of an accident, costs for building new rails and streets, overcoming regulations, and convincing the public that this is a better option than taking the regular street buses or the subway. Right now there are no public plans for this to be built, though demand has steadily increased since China debuted their model of the bus. Hopefully in the next year or so, somebody will step forward to lead the next generation of city transportation by making the straddling bus a reality.